This weekend at San Diego Comic-Con Sega revealed that it will be releasing two new Sonic the Hedgehog titles. Sonic Mania and an as yet untitled original Sonic game will be released on consoles and PC next year. The news was released to coincide with Sonic's 25th anniversary. 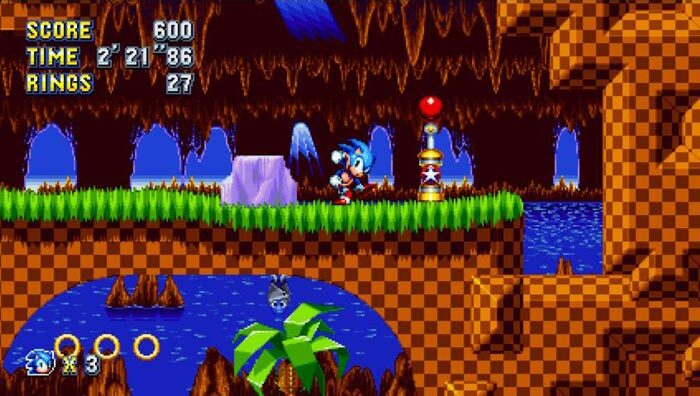 This game reimagines iconic zones and acts from Sonic's 2D history including; Sonic the Hedgehog, Sonic the Hedgehog 2, Sonic CD and Sonic the Hedgehog 3 and Knuckles. The developers have then added in some completely new zones, acts and bosses. "Sonic Mania was born out of our fans' love of the classic Sonic 2D platform games," said Takashi Iizuka, Head of Sonic Team. Iizuka described the collaborative development of Sonic Mania as "a passion project for the entire team." Further details about this new game will be revealed later this year. Sonic Mania will be digitally released in spring 2017 on PS4, Xbox One, and PC. This new "epic title," is being developed by Sonic Team, who previously worked on Sonic Colors and Sonic Generations. Details about this game are pretty scarce but at least the team have put together a video teaser trailer for Sonic-hungry gamers to have a look at, as embedded below. The video starts with a scene set in "the darkest of times" with a recently destroyed, burning cityscape. The world needs a hero, we are told, and then we see Sonic atop of a building, he powers up, curling into his signature super-fast spinning form to take on some sinister oppressive force. Sonic is joined by and smaller/younger accomplice in his quest. This as yet untitled Sonic game will become available in 'Holiday 2017' and, according to Polygon, will be made available for PS4, Xbox One, PC, and the Nintendo NX. I never thought Sonic transitioned well away from side-scrolling. There have been many good side-scrollers over recent years showing that it's still a popular genre. But the trailers here suggest that the first game is just a re-release with low-quality graphics and framerates and the latter isn't a side-scroller. I'd love to see an up-to-date side-scrolling version of Sonic. Otherwise, it needs to be parkour style like Mirrors Edge or something. I felt that was the first “3D” platformer that got it right. Well that's what Sonic Mania is. After watching Super Bunnyhops video about it, I have a bit of hope about it. Why? its made by the teams that made the excellent mobile ports. They are long time fans that started off in the fan game community. Its not made by Sonic Team or DIMPS, ie the people who have been ruining Sonic for so long. It's classic Sonic. I have to say Sega are one company that gets a big thumbs up. Lately they haven't been biased towards console releases and don't seem hell bent on telling you how things should be. They get on and make games that you either like or don't. Although very happy about the 2D release of Sonic. I'd like to see some more games from Sega in the style of Hell Yeah! Wrath of the Dead Rabbit. I thought this was a great little modern side scroller.